Fixture shields are available - call the Municipal Light Plant to request one. Watch the presentation and get tips about good lighting here. Research has shown that artificial light at night can affect human health, and has adverse consequences for trees and plants, birds, turtles, bats, and even fireflies. To help inform residents about the importance of outdoor lighting, the NRC hosted a workshop with lighting expert Bob Parks of Smart Outdoor Lighting Alliance. • Talk to your neighbors about lighting, and more! New streetlights are coming to Wellesley. The Municipal Light Plant is planning to replace the town's 3,000 cobrahead streetlights with energy and cost saving LED (light emitting diode) fixtures by the summer of 2018. See what to look for when choosing your own fixtures. It's possible to have safety and stars. Proper lighting saves energy, brings back the night sky, supports human health and helps wildlife. A successful lighting project addresses public safety, public health, the natural environment, and energy savings. Visit Darksky.org for more information. A Special Report in the March/April Issue of LED PROFESSIONAL about the environmental impact of lighting by the International Dark Sky Association. An American Medical Association report says the new energy-efficient lights can put people and animals at risk. Read about the project and many lessons learned. The delicate balance between visual comfort and neighborhood character versus maximum energy efficacy remains an important element of a successful LED conversion. At an absolute minimum, every city should plan to install adaptive controls to allow for the initial reduction to compensate for lumen depreciation. This feature alone will pay for itself in energy savings, and the 20-50% increased fixture life that running them at reduced current will produce. The City will chooose 3,000 degree kelvin LED's after installing test lights of differing color "temperature" and asking for resident input. 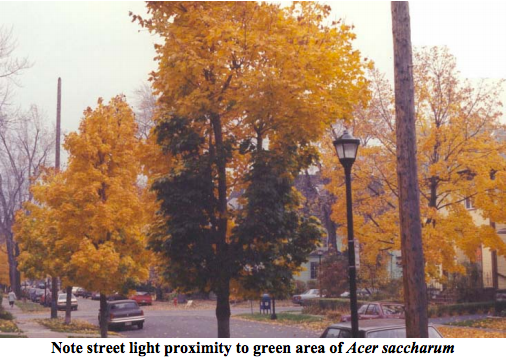 The length of nighttime darkness is a critical trigger for many deciduous plants to start the process of losing leaves in the fall (abscission) and entering a period of dormancy. Phytochromes mediate abscisic acid, which is responsible for these two actions. 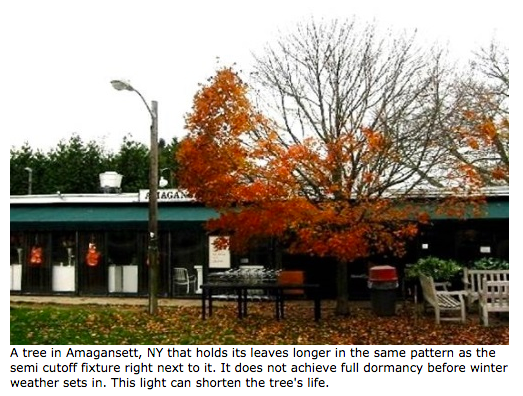 Artificial nighttime light can "fool" a tree into retaining the chlorophyll in its leaves too late in the season when deep frosts kill the leaves. Instead, the tree should be turning the various compounds of leaves into sugars and bringing these nutrients down into the roots for storage prior to the leaves being killed off. Trees and shrubs continue growing into autumn because of artificial daylight and fail to harden properly before winter. To properly cope with winter extremes, trees need to create special leaf-like structures to safeguard next year's growth locales. We know these as buds. The protective covers on the leaf buds are actually highly modified leaves coaxed into growing that way by high concentrations of abscisic acid produced by the tree and controlled by phytochromes. The Town of Fort Myers Beach and the State of Florida regulate lighting on the beach during turtle nesting season. "On a natural beach, the lighter seaward horizon guides sea turtle hatchlings to the water. Artificial lights, however, confuse the hatchlings and they wander inland." Fireflies are a summertime staple, a magical element in many childhoods. But the numbers of "lightning bugs" appear to be dropping. A UVA study is examining whether their ancient signals might be lost in the glare of artificial lighting. "Most fireflies find a mate by flashing. They must be able to see the flash of a prospective mate and return the flash. We don't know to what degree outside lights affect a firefly's ability to locate a mate. Streetlights produce a type of light different from house lights, and we'd like to determine if one type of light is more detrimental than the other." Audubon Lights Out Program "Lights Out programs not only save birds but they also save money and reduce greenhouse gas emissions." Robin populations in areas with large amounts of artificial light frequently began their morning chorus during true night. Chorus initiation time, relative to civil twilight, was positively correlated with amount of artificial light present during true night. As many as a billion birds die each year in this country as they attempt to follow their seasonal routes — flying north in summer months, south in winter. Because many songbirds, sea birds, and other avians rely on stars to navigate, they grow confused by artificial lights. Mr. Cuomo said state buildings will shut down extra lighting from April 15 through May 31, when birds come to the northeast to breed, and from August 15 through Nov. 15 when they head for softer climates as far away as the Caribbean. Night Lights - Too Much of a Good Thing? Moths can be drawn to a standard street light from up to 400 feet away. Some die immediately when they fly into the light, while others may get caught in a web or eaten by birds and bats. Since these nocturnal insects play an important role in the ecological food chain, excessive night lighting is a concern. Moths lead simple lives. They don't even eat - many species do not have mouths. Their only goal is to reproduce, guided to suitable nesting grounds by the shadow of the moon. Every time a person shields a porch light on their house, they're helping. Disruption in circadian rhythm is recognized by the AMA as having direct health consequences. Research is showing correlations between improper lighting and cancer, depression, obesity. Light at night is bad for your health, and exposure to blue light emitted by electronics and energy efficient lightbulbs may be especially so. 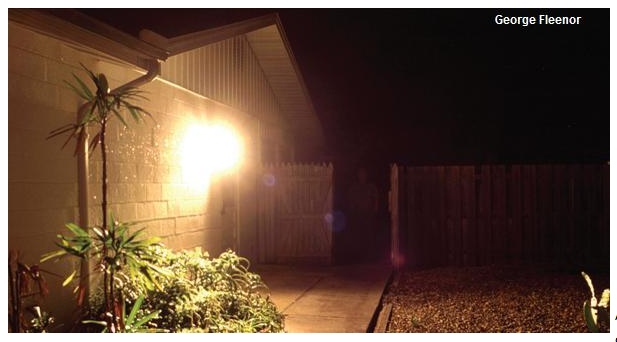 "Bad lighting at night can even make you LESS SAFE and be beneficial to criminals by creating deep shadows that offers concealment to them." Over 40 cities and towns in Massachusetts have Lighting Ordinances. Enacting simple guidelines, such as pole height, proper mounting, shielding, type of bulb and color (temperature) of light can yield big results. He said bluish light, which is harsh, interrupts the human body’s production of melatonin, a hormone that promotes sleep; this light also confuses nocturnal and migratory animals, and causes vision confusion in older drivers. By contrast, reddish light, which is softer and has a lower color temperature, allows the body to prepare for sleep, Beatty said. Communities making decisions about replacing street lights should use care in selecting the new fixtures, focusing not only on the kind of light but also the color temperature, Beatty cautioned. LED lights typically don’t need to be replaced for 25 years — a long wait if a municipality realizes early on that it chose the wrong color temperature. The Town of Gloucester requires that: Any light fixture used to illuminate parking areas shall be shielded so as not to shine on streets or adjacent properties. 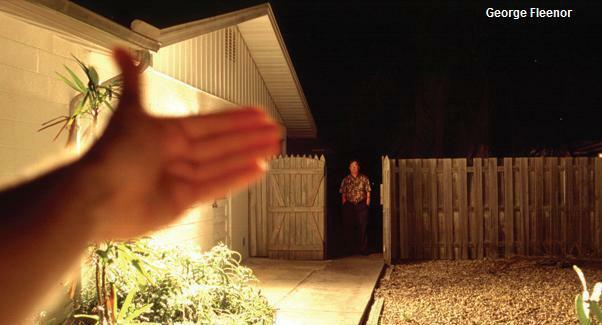 Excellent photographs and information on glare, safety, shielding, and how to have a discussion with your neighbor!